In a classroom on the third floor of KIPP Renaissance High School (KRHS), students energetically engage in a lively discussion regarding race and academic expectations. As each scholar answers, the instructor probes their thought process, encouraging them to deepen their answer or add broader context to it. In turn, the students expound and expand on each other’s opinions, give compliments, or respectfully disagree and offer alternative ideas. Though this classroom is set inside a high school, it is actually a full-credit college course taught by a full-time faculty member and offered through Bard College. It is one of several classes available as part of a degree-granting program to KRHS students who are enrolled in Bard Early College Academy at KIPP Renaissance (BECA). BECA is a program designed to allow KRHS scholars to graduate not only with a high school diploma, but also with an associate’s degree in humanities — free of charge. 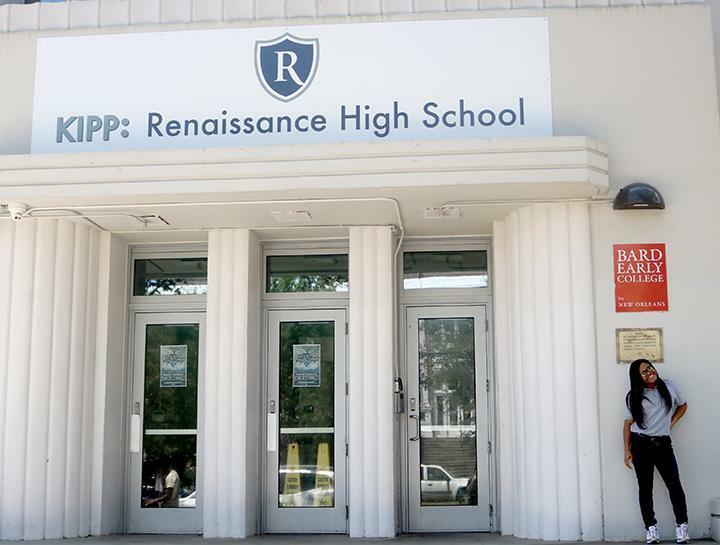 Bard Early College Academy at KIPP Renaissance is the first program of its kind in the country where a college has established a degree-granting satellite campus within a high school. BECA offers KRHS students a chance to earn 60 college credits in two years, many of which are transferable to other institutes of higher learning. This allows scholars to get a jump start on their four-year degrees by saving time as well as money. KIPP New Orleans Schools (KNOS) and Bard have a partnership that goes back to 2011, when Bard opened an early college, non-degree-granting program in New Orleans that offered a half-day of college classes to students from high schools across the city. However, when the school leaders at KRHS sought to transform their academic programming, it seemed the perfect time to create a revolutionary experience for scholars that expanded beyond the existing partnership. At the same time, the people at Bard had been forming ideas about a different model for Bard Early College. 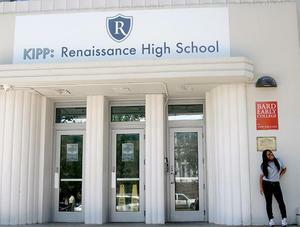 Currently the course work at KIPP Renaissance is designed so that students can complete the majority of their high school-specific course requirements in the first two years, allowing them to then decide between two rigorous paths: BECA or the AP Capstone diploma with a Career and Technology Education (CTE) Pathway of either pre-engineering, digital media, or skilled craft. To preview the BECA program for underclassmen, Bard faculty collaborate with ninth and tenth grade teachers to introduce them to the college-level inquiry and discussion, so that all KRHS students receive exposure to what a Bard classroom may be like. They also experience an English class co-taught by a KRHS teacher and a Bard professor. At the end of their sophomore year, each student, along with their family, makes a decision regarding their pathway of study and receives an individual action plan based on that decision. “We genuinely believe every student has the opportunity to have a choice,” Pierre-Floyd said. Destini White was one of the sophomores last year who chose to apply to Bard. “I was intrigued by the idea of earning an associate's degree while also earning my high school diploma,” she said. Tamika M. White, Destini’s mother and a special education case manager/parent engagement coordinator at KIPP Renaissance, said the Bard program was the deciding factor in sending Destini to KRHS. Destini, along with others who were interested in BECA, had to apply like any other potential college student. The selection process lies fully with Bard and focuses more on a scholar’s potential for growth mindset based on intellectual discourse than their GPA. The program accepts 50 students a year, based on how successfully students navigate a demanding three-round interview and discussion process. In 2018, 60 out of 130 KRHS sophomores applied. Destini said she found the application and interview process to be very rigorous. “I was placed in an unusual atmosphere, but I was very curious for what would lie ahead,” she said. As part of the process, students are given a text to read and then sit down with 16 other applicants for a 90-minute seminar with a faculty member. “We think applying to college needs to be about self-selection and not just institutional gatekeeping,” Tremaine said. “Our process allows the applicant to get an up-close and personal sense of what they are getting into and allows the student to make a decision about what is right for them. It also gives us a chance to see them without distraction. For the last month, the 50 KHRS scholars who have been accepted into Bard have been tackling the dual roles of being a high school and a college student. For most, the transition has been an incredible experience. Destini is taking Qualitative Research Methods, college-level algebra, college-level French, college seminar, and an ACT prep class this semester. At the moment, college seminar is her favorite class. “Seminar is my favorite class, because of how open the space is and the energy the professor brings to the class each day,” she said. Along with her impressive college course load, Destini also participates in typical high school extracurricular activities at KRHS. “I am the president of our girls club, Ladies of Elegance, president of the Drama Club, a member of our National Honor Society, and I am in the running for vice president of student council,” she said. The blending of college and high school life could have a lasting impact on the educational scene. The faculty and administrators involved in the program from both KRHS and Bard understand that this experiment not only impacts students currently enrolled in BECA, but could have a ripple effect nationwide. Of those students enrolled in a Bard early college program nationwide, 90 percent graduate with a two-year associate’s degree. An independent study commissioned by Bard found that its students of color are 37 percent more likely to complete a bachelor’s degree than a matched group of peers. According to a study by the American Institute of Research, students who earned 20 college credits in high school are 20 percent more likely to finish a bachelor’s degree on time. In addition, these programs save money—an average of $22,000—for students and their families, as well as the state and federal government. “This is an idea of national consequence,” Tremaine said. On a local level, this program could change the lives of some scholars in a very tangible way. “Our goal is for our students to graduate with a passport in one hand and 60 college credits in the other,” Pierre-Floyd said. Destini agrees that attending Bard Early College Academy and graduating with an associate's degree will certainly affect her future in many positive ways.